Analog Devices, Inc. (ADI) has announced the availability of the SHARC Audio Module (ADZS-SC589-MINI), a hardware and software platform that facilitates efficient product prototyping, development, and production for a variety of digital audio products. 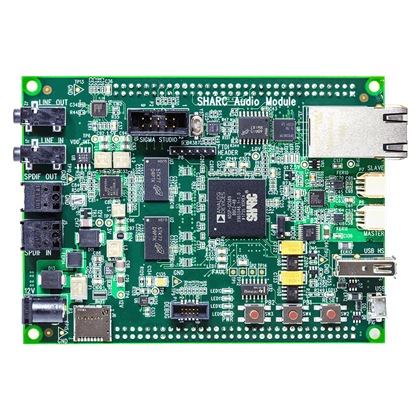 At the heart of the SHARC Audio Module is ADI’s ADSP-SC589 processor, a state-of-the-art audio processing engine which incorporates 500MHz SHARC+ DSP cores and an ARM Cortex-A5 core. These cores, in turn, work with two 2 Gigabit DDR3 memories and a 512Megabit SPI flash memory UART, for MIDI and more; a Sigma DSP ADAU1761 at 96 kilohertz; a 24-bit audio codec; through a Gigabit Ethernet, with S/PDIF and one eighth-inch stereo jacks, and USB OTG and HS. It also has AD2425W A2B multi-channel audio interfaces and two 64-pin expansion connectors. The SHARC Audio Module is ideal for effects processors, multi-channel audio systems, MIDI synthesizers, and many other DSP-based audio projects. The SHARC delivers an innovative combination of high-performance audio signal processing components and a comprehensive software development environment. Product development efforts usually need a substantial investment in time and resources to choose components, create a prototype and develop a basic software structure. That prototype is then provided to developers so they can address their own product needs. The SHARC Audio Module can significantly accelerate the process because it is an audio platform that integrates a broad range of analogue and digital inputs and outputs with a software package that comes with a development environment. The SHARC Audio Module allows developers to evolve their own algorithms and user interface with SHARC’s compact, cost-effective, base platform with its optimized software and tools ecosystem. 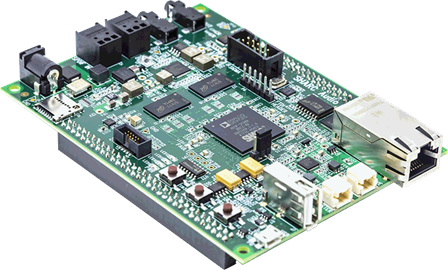 In addition to the main SHARC Audio Module, ADI also offers an expansion board called a “Fin,” which provides additional functionality. The Audio Project Fin (ADZS-AUDIOPROJECT) is a MIDI and musical instrument/FX daughter card that provides a control surface with a quarter-inch stereo input, output, with additional connectivity, and expanded signal accessibility.